On August 27, 2014 Quality Enhancement Cell (QEC ) Team and faculty members of DHA Suffa University participated in International Video Conference on the topic of “Academic Integrity and Plagiarism” by joining the conference from the DSU-campus. Presenter was Ms. Randa Al Chidiac, Executive Director, Library, Holy Spirit University of Kaslik (USEK), Lebanon. All HEC recognized universities throughout Pakistan were invited by HEC to participate in the conference from their respective locations. The conference was chaired by Advisor (Quality Assurance), HEC Islamabad. The video conference was much appreciated by all the participants as the topic is of an immense importance in the field of academia The conference was third in the series of video conferences organized in the month of August 2014 by Quality Assurance Division of HEC as part of its efforts in updating HEC’s Plagiarism Policy and increasing awareness about international practices regarding Plagiarism. The earlier two video conferences were attended by QEC Team of DSU on 5th and 6th August, 2014 at HEC’s Karachi Regional Center. Rear Admiral (R) Prof. Dr. Sarfraz Hussain, TI(M), SI(M), Vice Chancellor, DSU and Mr. Akhtar Nadyme, Director QEC, DSU were invited by Abdul Wali Khan University Mardan (AWKUM) and Success Foundation to attend the National Higher Education Conference on the theme of “Quality in Higher Education: Issues and Current Practices”. The conference was attended by the Vice Chancellors and Director QECs of various universities in Karachi. Dr. Mukhtar Ahmed, Chairman, HEC presided the conference. 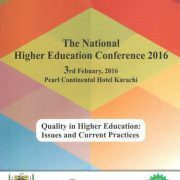 The conference was held on February 3, 2016 at Pearl Continental Hotel, Karachi. The attendees deliberated over issues related to higher education in Pakistan and discussed methods to enhance the quality of higher education in Pakistan. The orientation program culminated with questions and answers and an interactive refreshment session.